The Horusornithidae (Fig. 14.1) occur in the late Eocene (MP 17) locality La Bouffie of the Quercy fissure fillings, and their fossil record includes most of the major limb elements (Mourer-Chauvire 1991). As yet undescribed remains also exist from the "early Oligocene" of the USA (Mourer-Chauvire 1991). The single named species of the taxon, Horusornis vianeyliaudae Mourer-Chauvire, 1991, was about the size of the Redfooted Kestrel, Falco verspertinus. 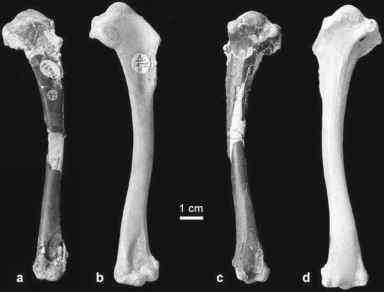 Although the humerus, too, differs from that of extant "Falconiformes," the greatest peculiarities are found in the foot morphology of H. vianeyliaudae. The species is distinguished from other "falconiform" birds in the absence of an ossified supratendinal bridge on the distal tibiotarsus, whose condyles also exhibit a distinctive morphology in being proxi-modistally taller and less widely separated than in extant Accipitridae. The tar-sometatarsus is elongated and the tip of the trochlea for the second toe more plantarly directed that in most extant Accipitridae. According to Mourer-Chauvire (1991) the morphology of the distal tibiotarsus indicates the presence of a hyperflexible intertarsal joint. Among other features (Mourer-Chauvire 1991), horusornithids share with extant Pandionidae, Accipitridae, and Falconidae a derived morphology of the hypotarsus, which exhibits two marked crests that are separated by a wide sulcus, as well as a derived morphology of the coracoid and ungual phalanges. Their exact relationships to other "falconiform" birds are, however, unresolved.